Some days, it might seem as if your 13-year-old is eating you out of house and home. Although this constant eating might worry you, it's normal. To promote healthy growth and development and to prevent excessive weight gain, stock your kitchen with the right foods. Consult your pediatrician if you're concerned about your teen's eating habits or weight. During early adolescence, a teen's caloric needs are greater than at any other time of life, according to HealthyChildren.org, which explains the ravenous appetite many kids have at this age. But that doesn't mean your teen can eat all the ice cream and french fries he wants. Knowing the number of calories your 13-year-old needs is a good base for a healthy eating plan. Boys need 2,000 to 2,600 calories a day; girls need 1,600 to 2,200 calories. Nutritional needs may be greater if your teen participates in sports. Your doctor or a dietitian can help determine your 13-year-old's specific caloric requirements. While calories are important, so are carbohydrates, protein, fat, vitamins and minerals. 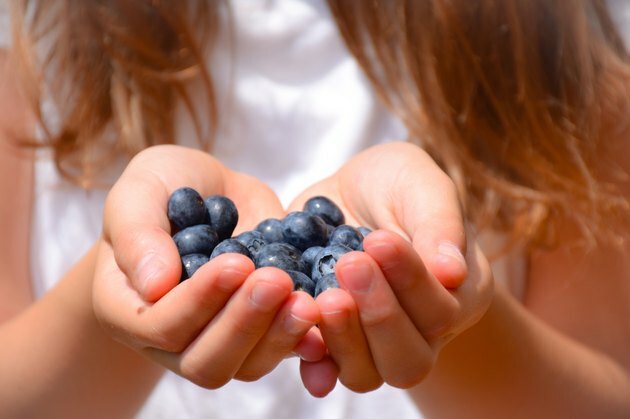 Your 13-year-old needs these essential nutrients to have a healthy body. Fruits and vegetables are a good source of healthy carbs and are rich in vitamins A and C, and also in folate, which teens need for growth and development. Make sure your 13-year-old gets 1 1/2 to 2 cups of fruits and 2 to 3 cups of vegetables a day. Whole grains contain healthy carbs and are rich in fiber, and also have plenty of with B vitamins and iron. Your 13-year-old needs enough iron to support muscle growth and blood volume. Young teens need 5 to 8 ounces of grains a day. An ounce of grains is equal to one slice of whole-grain bread or 1 cup of whole-grain cereal. Offer 5 to 6 ounces of healthy protein each day, which is found in foods such as poultry, fish, eggs, beans and lean red meat. These not only meet your teen's protein needs, but also provide iron, zinc and B vitamins. Low-fat or nonfat milk, plus fortified milk alternatives, such as soy milk, provide protein and carbs and are rich in calcium and vitamin D, which are important for bone health and growth. Your 13-year-old needs 3 to 4 cups of milk or yogurt a day. Don't forget the fat. Good sources for your 13-year-old include avocados, nuts, seeds and vegetable oils such as olive and canola. While healthy fats are important, they are a concentrated source of calories, so limit the intake to no more than three servings a day, in which one serving is equal to 1 tablespoon of oil, 1 ounce of nuts or half an avocado. According to a 2013 study published in JAMA Pediatrics, teens in the United States have been eating more calories and making poorer food choices compared to previous decades during the study period; the results from this study also coincide with the obesity epidemic. Fast food, fried foods, sugary drinks and junk foods such as cake, cookies, chips and other sweets may be contributing factors. It is recommended that you limit these foods in your 13-year-old's diet to help control calories and improve nutrient intake. The American Academy of Pediatrics says that sugary drinks, such as soda, energy drinks and sports drinks, provide extra calories but do not have the essential nutrients kids need. In particular, energy drinks have no place in a growing teen's diet. The caffeine in these drinks may affect your child's developing neurological and cardiovascular system, says the AAP. As a source of trans fat, fried foods such as french fries, doughnuts, cookies and other packaged goods are not good for your teen's health, and may lead to high cholesterol levels. To control hunger and maintain energy levels, your child should eat three meals and two or three snacks a day. For breakfast, an egg plus a bowl of whole-grain cereal with nonfat milk and strawberry slices provides a good start to the day. Or, if time is short, make a smoothie with nonfat Greek yogurt, bananas, blueberries and peanut butter. A good lunch for your 13-year-old might include a turkey sandwich on whole-wheat bread, with sides of cucumber and bell pepper slices, grapes and whole-grain crackers. Or, offer a slice of veggie pizza, and include an apple and a tossed salad with balsamic vinaigrette as side dishes. At supper, your teen might enjoy tacos made from ground, white-meat turkey, served with corn on the cob, brown rice and beans. Also, veggie-and-tofu lo-mein makes a healthy, kid-friendly dinner choice. For in-between meals, good snack choices include nonfat yogurt with whole-grain cereal; apple slices with almond butter; carrot and celery sticks with low-fat salad dressing; dried fruit and nuts; low-fat cheese and whole-grain crackers; sliced turkey rolled with romaine lettuce; air-popped popcorn, hummus with toasted whole-wheat pita or mixed greens with balsamic vinegar and oil. Teen boys need more calories than teen girls, so boys will need larger serving sizes of healthy foods to meet their nutritional needs. Your 13-year-old is developing a sense of self and is gaining greater independence. You can help foster that independence and support healthy eating by providing the nutritious foods your teen needs and by allowing him to decide what and how much to eat. To encourage better choices, involve your teen in some of the decision making. Let him find recipes, select items at the grocery store, and let him help prepare his own meals, including allowing your 13-year-old to make his own breakfast and snacks. American Academy of Pediatrics: Clinical Report–Sports Drinks and Energy Drinks for Children and Adolescents: Are They Appropriate?